In this video, motorhome expert Dave Hurrell answers a series of questions about the importance of safely loading your motorhome before your travels. 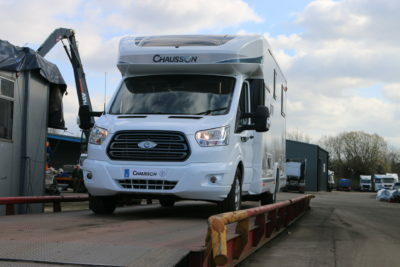 Why is loading your motorhome correctly so important? Your motorhome manufacturer will have carefully calculated the maximum weight of your motorhome, also known as the MTPLM, to make sure when you’re driving on the road you’re not only safe, but you’re also legal. If you’re driving a vehicle that is potentially dangerous because it’s overloaded, it can affect your motorhome insurance cover and you could also be fined and face points on your driving licence, if stopped by the authorities. On-road safety is also a very important issue and an overloaded motorhome will affect braking and stopping distances. 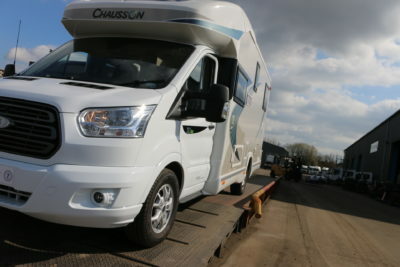 It’s also going to affect the way the vehicle handles as well as the load on the motorhome’s tyres. Tyres on any vehicle have a maximum load and if you exceed this, it could result in a puncture or blow-out, and possibly an accident and insurance claim. 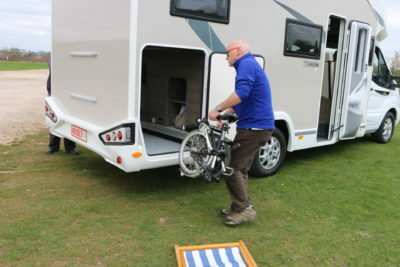 Are there any restrictions on loading a motorhome? 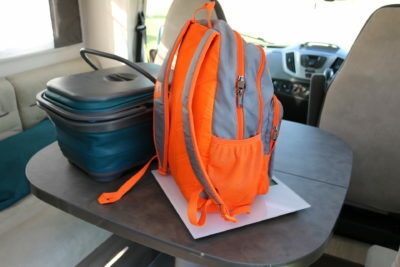 There are restrictions on what you can take in your motorhome and that relates to the payload figure provided by the manufacturer of the vehicle. Payload is calculated in several different ways, but essentially, you subtract the weight of the vehicle in running order (MRO) from the maximum weight (MTPLM) of your motorhome, found on the weight plate. The MRO is the weight of your motorhome with its wheels and engine, ready to go. And quite often this is calculated to include the weight of the driver at 75 kilograms, 90% of the fresh water, fuel, and gas, before any accessories have been added on. Everything else that you load into or on to the vehicle beyond that will impact on the payload. For example, awnings, satellite dishes, bike racks, or things are actually bolted to the vehicle, as well as any passengers and all the kit that you take away with you. The initial payload figure is based on the motorhome’s base model, so anything that’s added as an option at the factory, such as an automatic gearbox, a larger engine or even metallic paint, will also impact on the payload. One way of knowing the weight of everything that has gone on to the motorhome is by taking it to a weighbridge. This will help you to calculate your payload and check that you’re motorhome isn’t overweight. We paid £12 to have the motorhome weighted and receive print outs of the weights. 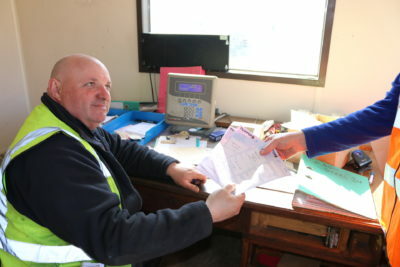 To find your nearest weighbridge visit the gov.uk website or contact your local council. What happens at a weighbridge? You drive your motorhome on to the weighbridge so just the front axle is on the weighing device. That then gives the weight that’s bearing on the front axle. The motorhome is then driven onto the weighbridge completely and the whole vehicle is weighed. Then the vehicle is driven forward until only the rear axle is actually on the weighbridge and then that gives you the weight for the rear axle. You will then receive a printout of exactly what all the weights are. The overall weight in running order of the motorhome we took to the weighbridge – no kit, no driver an empty water tank, was 3020kg. The weight plate tells us it has a maximum weight (MTPLM) of 3500kg, which means we have 480kg of available payload. Now we know our available payload, we also want to know the weight of all the kit that we’re going to load into the motorhome. One of the best ways of doing this is to weigh each individual item before you load it. This can also give you a bit of a ready reckoner for the future, giving you a rough idea of how much your kit weighs when you’re loading your motorhome up, each time you go on holiday. When you’ve done loaded all your kit into the motorhome, it’s worth making a return trip to the weighbridge and re-weighing the vehicle to make sure that you know you’re safe and legal and that the motorhome is well within its allocated payload. How should I load my motorhome? Put light items in the higher level lockers. 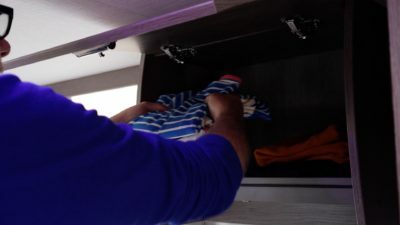 This is also important, because, if you store heavy items in overhead lockers and they burst the catch, they can fly out into the interior of your motorhome and cause damage, or worse still, injure someone. 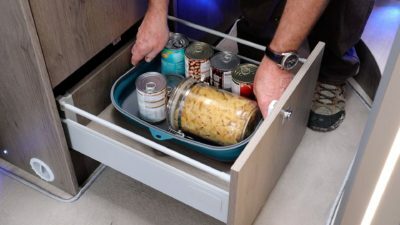 Stow heavy heavy items down in the lower lockers, under the seating, or maybe under the bed, or in the garage, if your motorhome has one, putting as much as possible within the wheelbase. Loading heavy items will affect the handling so you need to be careful to distribute the load and consider the weights that are bearing down on each individual axle. If you have a motorhome, with a very large rear overhang, the more weight you put behind the rear axle is going to affecting handling. Too much weight at the back could lead to a snaking affect when overtaking, or changing lanes, especially if there are slippery road conditions. Secure items, especially if they’re heavy. There are various things on the market which allow you to secure luggage, bikes, and items in lockers. Make sure bikes and scooters are securely fastened to the bike rack and that that the rack has actually been mounted correctly so it can bear the weight that you want it to carry. Also, bear in mind that anything that’s on the back of the vehicle is going to increase the amount of weight on the rear axle, so you need to know that the rear axle loading is within the parameters stipulated by the manufacturer. If you have a motorhome with a garage, there will be a maximum weight you can load into it, usually between 150 and 250kg. But be careful not to overload the rear axle because you need to take into consideration all of the other things that are loaded into the motorhome. 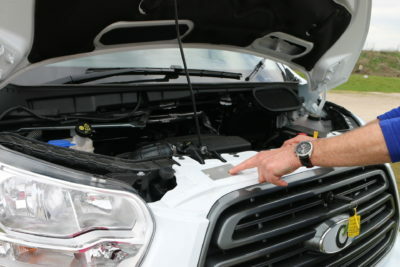 Before setting off, walk around your motorhome to make sure things like your hook-up lead is disconnected, and that any other bits and pieces on the outside of the van are correct and ready for the road. For example, check bikes are properly secured so they don’t fall off en route! Take plenty of tea towels. They’re great for wrapping things up or to use as padding in lockers and drawers. 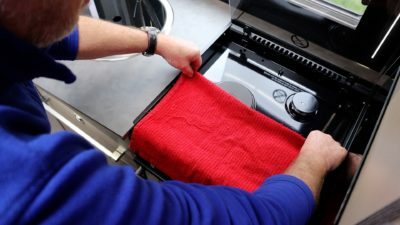 Plus, you can put them under the cooker lids and under the grill pan to stop things rattling. If you have a microwave oven, make sure you take out the plate so it doesn’t fly out if there’s any violent movement of the vehicle. If you have a TV make sure it’s stowed correctly. Even if it’s mounted, take it out of its mount, wrap it, and put it in a low locker face down, or under a cushion so that it can’t move around when you’re travelling. Don’t carry too much fresh water. The more water you carry, the more you’re eating into your payload. It’s a good idea to drain the water tank down and make sure you don’t travel with a full tank so it gives you more payload and improves the handling of the vehicle. Some motorhomes, allow you to lower the contents of the water tank to 20 or 50 litres with a special internal valve. Look carefully at how much food you’re carrying. Don’t carry too much – you can always shop when you reach your destination or eat locally. Make sure that the fridge is latched, so the contents don’t distribute themselves around the inside of your motorhome whilst driving! It’s not a packing issue but make sure your gas is turned off before you travel. 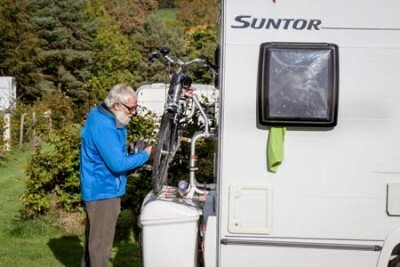 Got any motorhome loading tips to share with other owners? Feel free to leave a comment in the box below. I appreciate the topic is loading a vehicle and maximum weights. With the handling problems that may crop up. Nothing has been said about tyre pressures. If they are different across an axle it will affect handling despite the vehicle being loaded correctly. If they are below the correct pressure all manner of nasties can happen. In particular handling, overheating and blow outs. 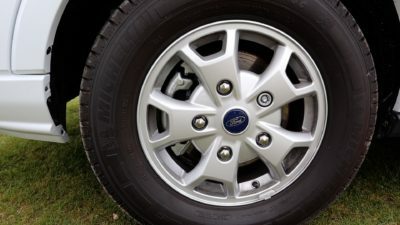 Tyre pressures must be at the correct level for the weight of the vehicle. The manufactures will have provided a plate with this information. I use pressure indicator dust caps. They change colour if the preset pressure has not been achieved. Hi David, we do briefly mention tyres and you’re correct that you need to be careful of tyre pressures. A tyre pressure monitoring system is a great way of making sure you keep on eye on your motorhome tyre pressures. Hi Jane, you can turn on the subtitles in YouTube by clicking on the subtitles icon at the bottom right of the video. Ideal for New comers, standard practice with us, plus always keep heavy stuff low and over the rear wheels if poss. As A driver who has just had “heart trouble” could you do an article about what it means to have entitlement C1 removed from your driving licence?. My C1 entitlement is going to be removed when/if I get my licence returned. Lots of people might be driving about with no entitlement for the van they are driving unawares. New to Motorhoming so whilst most of the information is common sense, it’s good to know we have packed ours (Max) well and correct………..off to weighbridge before leaving for our very first trip!!!!!!! Very good, but there was no indication of what a typical cost of weighing the motorhome at a weighbridge is. Also a simple statement of how to find your local weighbridge would be nice. There is one at our local refuse dump (recycling centre) and I think scrapyards might do it for a fee. The scrap yard I go to with a van load weighs the van loaded, then I remove the metal and they weigh it again so they know how much has been dumped. I don’t know if they would do a motorhome, I guess they might, for a fee. Hi Andrew, that’s a good point and we’ll add this information into the article. We paid £12 to weigh the motorhome and receive the print outs. Thanks for your comments. Interesting but really all common sense…Thank you..
We use bubble wrap to stop things rattling and to fill up empty spaces on shelves so things cannot slip around. It is also useful to protect bikes from scratches and to keep other items from colliding in the garage. Its main advantage: its very light and hardly weighs a thing! Great idea Veronica. Thanks for sharing.